In the summer leading into my senior year, I received a letter from my literary hero. My mother — noting his famous name on the return address — hand-delivered it to me while I shelved books at the local bookstore. “This came for you,” she said. I glanced up from the stacks, read the return address, then slowly unfolded the letter. There was my name at the top, followed by the backstory: how he’d received a copy of an essay I’d written and been humbled by its contents. Tasked with writing about a “great American,” I’d bypassed the usual fare (presidents, astronauts, etc. ), and wrote instead about him — the writer who’d changed me. And just below, in his thick black scrawl, his signature: Ray Bradbury. I was dumbstruck, dumbfounded, just plain dumb. In my stupor, my mind leapt to a June night five years prior, when directly following closing ceremonies for my seventh-grade school year, my mother had driven me to this very bookstore to pick out a book of my choice. It was a rare, late-night bookstore visit, and as I browsed the shelves, pointer finger dragging across the tops of the titles, it eventually fell to Ray Bradbury’s Dandelion Wine. I chose it, devoured it, and as a result of its power, rerouted my life’s trajectory. To receive an unprompted congratulatory note from the man who’d written it — in that very store, no less — seemed a kind of kismet worth capitalizing on. And since his letterhead noted his home telephone number, I decided to give him a call. I picked up the phone, dialed, waited nervously for the rings to give way to Ray. “Hello?” a booming voice answered. Following a few minutes of cyclical thank you’s and bonding over our shared Midwestern roots (Ray hailed from Waukegan, Ill.; I, from Fort Wayne, Ind. ), I at last grew bold, did what any budding fiction writer might when he had his hero on the line. “Well, come on over then!” Ray agreed. The reality was that 2,200 miles separated Indiana from L.A. — no short commute, especially by way of my 18-speed Huffy. And so, I settled on my second best option: I used my earnings from the bookstore to purchase a plane ticket. A few months later I boarded a plane, hailed a taxi, scheduled a shuttle, and at last reached Ray Bradbury’s front door. At 17, Ray Bradbury, too, indulged in the occasional lie. He didn’t believe it, though he hoped to make it so. Yet not for too long. Throughout the 1940s Ray continued to hone his short story skills, publishing dozens, many of which found their way into his debut collection, Dark Carnival. By the mid-1950s he’d become a household name — The Martian Chronicles and Fahrenheit 451 doing much to solidify his status. Despite his yearbook quotation, success had hardly been guaranteed. Ray, I was proud to learn, was even scrappier than I was. As a teen, he’d plucked scripts from dumpsters behind Hollywood studios simply to study them. Upon getting a knack for how they were written, he went further by pitching his material directly to the stars themselves. Scrappier still, a decade or so later — with a pregnant wife at home and $40.00 in the bank — Ray boarded the bus to New York to share his work with editors. On his final night staying at the YMCA, Doubleday editor Walter Bradbury suggested he link together his Mars stories. Ray stayed up all night doing so, crafting an outline that later became The Martian Chronicles, and returning home with a $700.00 check. Now that’s how it’s done, I remember thinking. That’s how you become a writer. The shuttle dropped me in front of the Bradbury home at a few minutes before 9:00 a.m, leaving me three long hours to whittle away before our noon meeting. I perched on a low wall across from his yellow and white Cheviot Hills home and waited, reaching for my tie-dyed-covered spiral notebook and jotting some notes. Reading them now, I see a young man so full of zeal that he’s all but unrecognizable to me. Maybe it was my variation of Ray’s aspirational yearbook prophecy, my roundabout way of saying “Headed for Literary Distinction” in a more personal, low-stakes fashion. At noon I made my way up to the Bradbury doorstep: shook the water from my hair, wiped my feet on the mat, then knocked on the front door. His wife Maggie answered (“Well hello there!”) and led me into the living room to meet Ray. There he was, smiling broadly with red suspenders blazing. “Welcome!” he called, and for the next hour or so, proceeded to offer me every key to the universe he had. He walked me through the books on his shelf, shared with me his paintings, his poems, his work. In turn, I committed several embarrassing acts. Including giving him my senior photo (the one with me holding a copy of Dandelion Wine), as well as a baby food jar filled with rainwater and dandelions gathered from my front yard, vintage 1998. “Dandelion wine,” I explained, and though it wasn’t — not the kind you’d want to drink anyway — he accepted my offering, seemingly appreciative of my attempt to strive toward the metaphor he himself had written about: how we might bottle, cork, and stopper time by capturing a glint of summer in a jar. For a moment it seemed he’d transported back to Waukegan, to being a 12-year-old boy in his grandfather’s lawn, dashing once more in search of dandelions. And it’s how I continued to feel through our decade-long correspondence, most of which was filled with affirmations by him and the airing of anxieties by me. In recent years, these letters, too, have become difficult to return to. Not only because Ray is gone, but because that version of me is gone, too. Who was that earnest young man in those letters? I wonder. What ever became of him? I was lousy, but I loved me, too. Loved my zest and gusto and “anything can happen” mentality. The way the stars always aligned when I needed them to, the way the bottom-of-the-ninth-with-bases-loaded scenario meant the grand slam was always just a pitch away. Even today it’s an alluring idea: to imagine our lives as one eventuality after another. To dispense heartily with probability and believe in possibility instead. My essay was titled, “With Zest and Gusto the World Was Saved.” That’s about all I could tell you of its contents. It’s been lost for years, which is probably just as well. If my other writings from that era are representative, then I imagine it was a highly dramatic, purple-prose-infused caterwaul complete with lots of heart and not a lot of substance. As such, I have a hard time believing it was one of the “finest essays” Ray had ever read. In his letter, Ray noted that my essay had reminded him that he was a teacher, too; that there were people who were reading his words for more than the stories, but for the writing lessons they offered. The words are as true today as they were when I first read them. Only now, I know that Ray’s advice transcends writing. He was teaching me how to live. He kissed my cheek, called me his son, told me to live my life with zest and gusto. I waved goodbye, stepped outside, tilted my head toward the rain, and tried. B.J. Hollars is the author of several books, most recently The Road South: Personal Stories of the Freedom Riders, Flock Together: A Love Affair with Extinct Birds, From the Mouths of Dogs: What Our Pets Teach Us About Life, Death, and Being Human, as well as a collection of essays, This Is Only a Test. In the fall of 2019, his forthcoming book, Midwestern Strange: Hunting Monsters, Martians and the Weird in Flyover Country, will be released. Hollars serves as a mentor for Creative Nonfiction, and the founder and executive director of the Chippewa Valley Writers Guild. An associate professor of English at the University of Wisconsin-Eau Claire, he lives a simple existence with his wife, their children, and their dog. In those early years of the Book Club, Oprah would often, though not always, chose a little-known, "mid-list" book that would become an overnight bestseller. In a literary world where writers are playing the lottery against the longest of odds, Oprah was the winning ticket. Parenting and writing are chock-full of doubts and frustrations, stress and delight, but these challenges can also fuels a writer’s work by reminding us that writing is a choice like any other, and that uncertainty remains part of the process. Wonderful piece! I first read Ray as a child of the 1960s and those stories are embedded very, very deep… but still quite vivid. Your article is a touching counter-balance to the tales of the fans who went out to Jerry Salinger’s place with less noble intentions and got dispiriting results. But this kind of feeling for Lit, the kind your article testifies to, is the only kind I recognize: involving a part of the Imagination so deep and vast that it’s indistinguishable from the Soul. Beautiful piece. Ray Bradbury was the first writer I would search out in a bookstore — “I need another Ray Bradbury book.” There’s romance and mystery, wonder and terror — and always an intimacy to it. . I love it. Thank you so much for writing. I don’t know how many times I’ve read Dandelion Wine. Many. It’s never the same book, and I’m never the same reader. I always meant to write that letter and never did. I’m so glad that you did. I think if Ray Bradbury were here today he would say this essay equaled the first one and stick this one in his desk drawer with it. It made me feel like Ray Bradbury came back for the day to read it and I don’t even know how to thank someone that is able to create THAT feeling. God bless you. Ill say what Ray would say to you. KEEP WRITING. NEVER STOP WRITING. NEVER STOP LOVING IT. 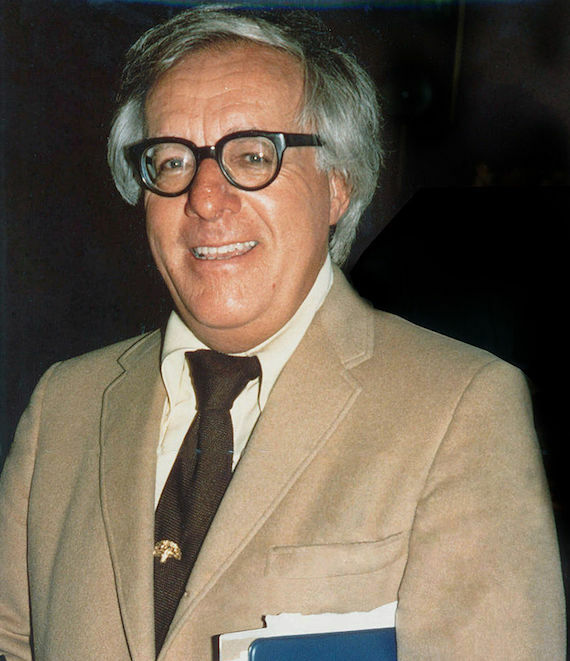 I’m so happy you had the life-changing experience to meet Ray Bradbury and receive his keys to the universe. Thank you for sharing them with us and reminding us how amazing he was and is. 1972 TV movie – The Screaming Woman. Riveted. I was 11 and immediately raided my dad’s library for his Ray Bradbury books. Still reading them. At a younger age I watched the movie “The Time Machine” from the H.G Wells novel. Way too young for those morlocks! I was maybe 8 or 9. My mom found me standing by my bed stiff with fear. (Probably why she wouldn’t let me see The Excorcist or Jaws at age 12). And both movies, of course slightly dated, but only slightly, are still scary as hell! Great essay. I loved everything about this. You capture not only the delicate, lovely relationship between teacher and mentor, but also your own growth as a writer in the process. We need more Ray Bradburys. Great writing. He’d be proud. John Carpenter got it because Ray Nelson got it. John Nada got it. And Le Guin got it. Learn how to invent your own life through language and don’t get made by another.